Dreams are mysterious – we all have them, and no one really knows where they come from or why we might dream about a particular subject or person. They rarely come true – but for one golf loving accountant from New Jersey, he not only dreamed of building a first class golf-only country club, he actually went ahead and lived it. We’re speaking of The Ridge at Back Brook located in Ringoes, New Jersey – about a half hour drive from Princeton in some of the most beautiful rolling countryside you’re ever going to see. The Tom Fazio-designed Ridge is the ultimate result of a ‘dream’ of its owner and creator, Joel Moore, and with the club, Moore provides a vivid glimpse into what he thinks about a lot – even in his sleep. 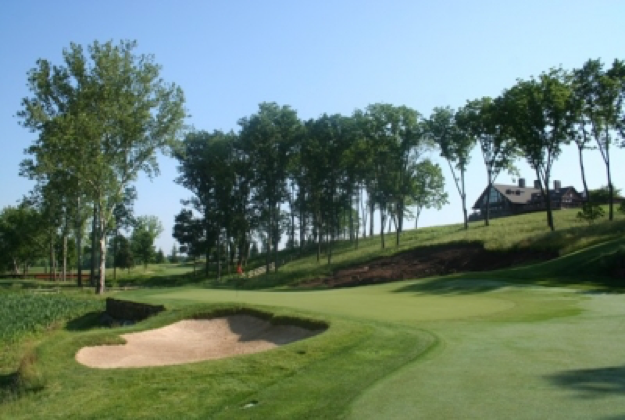 Tom Fazio beautifully shaped the golf holes into the environment at The Ridge. Here, looking from the fairway of the par four 1st hole. Lots of people talk about ‘realizing’ dreams, but for Moore, his story’s actually true. Maybe it was a dream or merely a ‘vision,’ but that morning’s revelation set Moore in motion towards building his golf club. Moore had been part of another new country club in the Princeton area in the early nineties, serving as its president for the club’s first eight years. But then the club’s residential community grew up around it to the point where it ‘matured’ into the private gated community that it was intended to be, and Moore felt it was only appropriate for non-residents like himself to move on. It seems the time was ripe to build a true golf-only club in central New Jersey, a place where purists could go to concentrate on golf alone, with no pool, no tennis, and no residential component to distract from the main focus – and to be designed to the highest standards possible for the people in the area. As would be true for any dream-made-real story, one event changed everything for Moore. He was on his way home from his accounting office one afternoon and looked at one of his inventory lists – and spotted a piece of property that he could check out taking the back way home. Upon visiting this new parcel, he was shocked at what he saw: elevation changes, streams, rock outcroppings and mature trees. Was this it? “I started hiking it and came across what we now call the ‘Ridge,’ which is an 80-foot vertical rock wall, and I got very excited and had trouble hiking out because it was getting dark,” Moore recalls. “I thought I’d come back the next morning, hoping to find the same spot. I was really stunned to find this land, but then the thought occurred to me that I wasn’t even sure I was on the right property, since of course there weren’t any markers.” He did return the following morning and hiked the land again and even saw more of it because he had plenty of daylight – and his further investigation revealed that he hadn’t been ‘dreaming’ the night before. From behind the green of the (442-yard) par four 3rd hole, you’ll see water challenges you from tee to green. Having found what he considered to be the ideal piece of real estate, now came the next crucial item in his ‘dream’ checklist – contacting Tom Fazio about making his golf aspiration come true. This was late in 1998, and golf’s 90’s construction boom was just reaching its apex – so there certainly was no guarantee that Fazio would even be interested in the project, since he was very much able to pick and choose where and what golf courses he wanted to design. Moore said the Fazio folks were very polite when he made the initial phone call, not knowing who he was or if he actually had a serviceable piece of land – so he obtained a topographical map of the property and sent it to them, with a promise from Fazio’s staff to look it over and get back to him with their impressions. A couple days later Moore got a call from Fazio’s business manager (at the time), Beau Welling, who said there would be a team from Fazio’s firm flying up to take a look at the property the next day. Moore met them at the airport and the group then spent the better part of two days walking the property, through all the briers and sticker bushes and various other hazards that an unimproved piece of land represents – but they also started to grasp the property’s potential for a special kind of golf course. Moore remembered that the Fazio group left very enthused about the project, particularly the notion of it being devoted to a golf-only club with no real estate component – which certainly opened up the possibilities for design. Again, they said they would be in touch after discussing it with Tom himself. The property once-over took place around the middle of November in 1998, and Moore thinks a couple months passed before it was decided that they’d all get together at the PGA show in Orlando to meet with Fazio face-to-face for the first time. All along, Moore had been insistent about Fazio’s presence in the project, but the architect was about to find out just how crucial his participation would be to its existence. Moore says their first meeting was cordial, but Fazio was curious as to why Moore insisted that it be him — and him only — to design the golf course. Moore recalled that Fazio’s first question was ‘if I decide not to do it, then who is your second choice to design the golf course?’ and Moore answered, ‘Tom, if you decide, for whatever reason not to do it, or we can’t come to an agreement, I’m not building the golf course. It’s going to be a Tom Fazio course, or there’s not going to be a Ridge at Back Brook. Moore explained that he’d been to a great many of Fazio’s courses and laid out the elements that he liked about them – and also the fact that there would be no residential component and that Fazio would have pretty much free reign on the property to create the best golf course that the land could produce, and a comfort level was reached and the deal was sealed. “But Joel had a great piece of land and would be able to work with the numbers – that was an important piece of the puzzle for me,” Fazio said. Once the parties came to terms, construction began (in the fall of 1999) with clearing of the land and starting the permitting process with the local government agencies. Because all the parties were determined to design the best golf course that they possibly could, it wasn’t easy to settle on a routing plan. Because of this commitment to flexibility and quality, Moore says it took 24-25 different routing plans to agree on the one they ultimately ended up building. The land’s natural gifts caused them to shift focus at times, including the discovery of the property’s most distinctive feature, red rock. Moore thinks the red rock makes it almost feel like you’re in Arizona, particularly the 80-foot high ‘ridge’ that serves as the backdrop to the par three eighth hole. The rock also is prominently seen on other parts of the golf course (in addition to the seventh and eighth holes), such as the par five fifth hole, the par four ninth and the par five finishing hole. The club opened, red rock and all, in 2002. “Fazio starts his hole designs from the tee box going forward, where a lot of architects start their significant shaping, etc. from the landing area into the green,” Moore added. Another aspect that will ‘wow’ you at The Ridge and all of Fazio’s courses is the width of the playing areas, with the architect’s generous usage of the property’s 300 acres to golfers’ advantage – so if you should hit one a little off-line, you’ll at least have a shot at playing it. 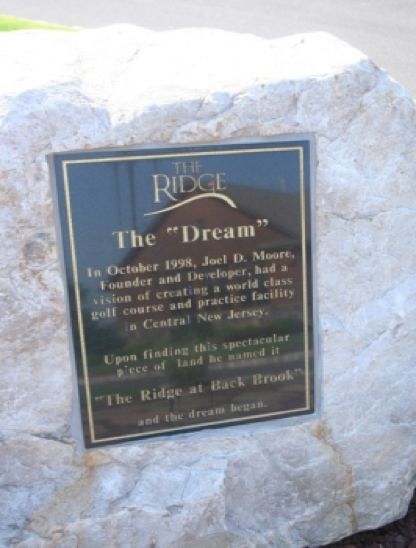 A plaque in front of the clubhouse is dedicated to the ‘dream’ that eventually came true in the form of The Ridge at Back Brook. Another way Fazio accomplishes playability at The Ridge is the multiple sets of tee boxes he’s designed. “With this much land, on many of our holes, we have six or seven tee boxes, with different angles and different elevations – so there’s a lot of variety,” Moore said. 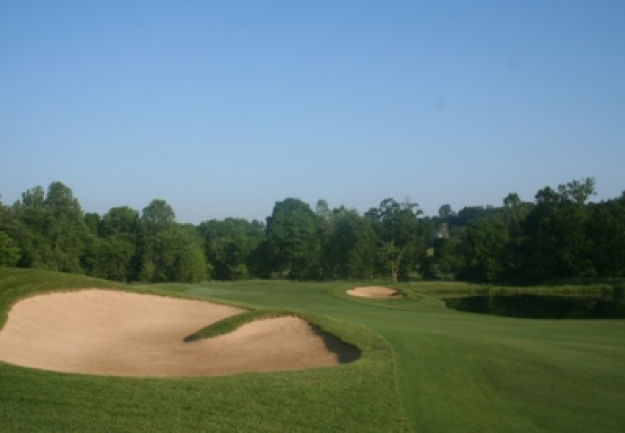 “And seeing as it’s a private club, and our members are playing the course on a regular basis, one of the things that makes us stand out so much is that we have so many tee boxes – so our members can get a different feel, a different length every day they play the golf course if we set up the course properly,” Moore elaborated. Setting up the course is assigned to the club’s superintendent, who does nothing short of a spectacular job keeping the golf course in championship shape. Particularly impressive were The Ridge’s greens, which Moore says are purposely maintained to tournament standards, every day. As far as favorite holes, Moore says he’s partial to the par five seventh hole, which includes a split fairway and red rock outcroppings influencing play, as well as the ‘short’ par four ninth hole, which plays along Back Brook, the stream that’s part of the club’s name. It’s also got rock outcroppings along the right side and behind the green. 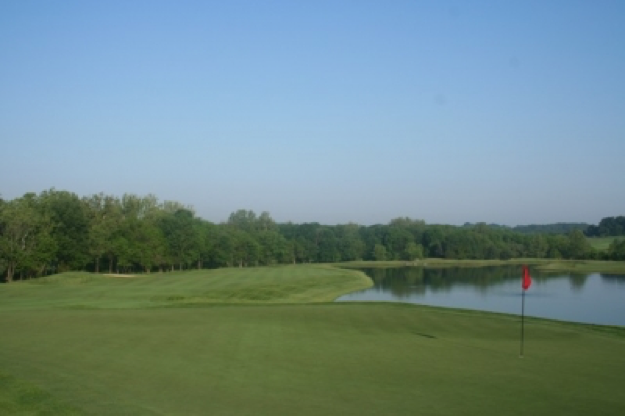 On the back side, Moore points to the par three twelfth as a hole that everyone enjoys – with its green jutting out into a pond – simply put, a beautiful golf hole. And no course of this stature would be complete without a memorable finishing hole – and the par five eighteenth fits the bill nicely, with its risk-reward qualities and dramatic red rock backdrop and the clubhouse staring down from above. The golf course, along with the service from the staff is all part of what Moore calls the ‘Ridge Experience.’ “The ‘Ridge Experience’ starts when you pull up onto our property, with 300-acres spread out before you. The outside world cannot see in, but our members can see out to the beautiful views and vistas. We want them to be able to shut out the outside world if they want to, take advantage of a world class practice facility, play a great championship golf course that’s in perfect tournament condition all the time, and then come back and do it again the next time.” To that end, Moore says they often receive notes from guests of the club who rave about the ‘experience’ and their treatment at the hands of the staff as well as accolades for the golf course. 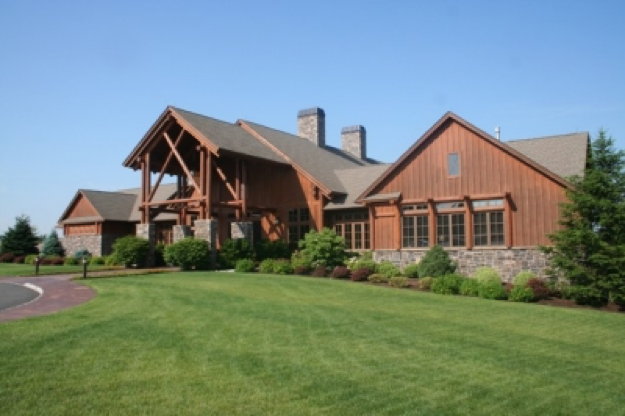 The Ridge’s impressive clubhouse looks like a mountain lodge. The Ridge is truly that special – and the club’s members are fortunate to be part of it. Fazio says he’s often asked to name his favorite golf course that he’s designed, and while it’s impossible for him to choose only one – he could see putting the names of sixty golf courses in a hat, and when one was drawn out, he’d be able to say that was the one. “If that were the case, and I ended up picking only one at random as the best course I’ve ever done, I’d honestly be able to say it’s true in the Ridge’s case — because The Ridge is that kind of a special place. You’re not going to find a golf course anywhere any better than The Ridge,” Fazio concluded. It just goes to prove that in the end, some ‘dreams’ really do come true.